Pat Summitt was a legend. She won eight national championships as head coach of the University of Tennessee women’s basketball team. Her 1,098 victories are the most of any women’s basketball coach ever. Coach Summitt was a tough coach on her players, but she clearly got the best out of them. Her reaction to a loss to an inferior opponent provides a terrific lesson about putting in your best effort that we can apply in sports, but also use in school or in our jobs. Early one season, Summitt’s Lady Vols lost a game at Vanderbilt. The Commodores were, quite frankly, not a good team. Tennessee had never lost to Vanderbilt. Summitt was not happy with the team’s effort. When the team bus arrived back on the Tennessee campus around 2 A.M., the players started to walk back to their dorms. Summitt instead called them into her office in the athletic building. She gave them paper and pencils, and they wearily watched the film of the game. 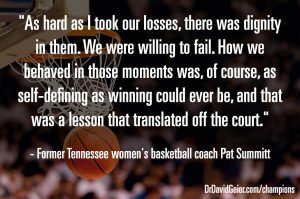 Summitt had her players write down every instance in the game when they did not ran as fast as they could or hustle for a ball they way she had taught them. By 4 AM, the team finished watching the game footage. Now Pat Summitt had them put on their uniforms, the same sweaty, dirty uniforms they had worn hours earlier in the loss to Vanderbilt. She lined her players up on the baseline at one end of the court and had them run suicide drills. Each player had to do a suicide run for every time they did not hustle in the game. Some players had to run 15 suicide drills. The impromptu “practice” ended at 6 AM, and Summitt still required her players to attend their 7:50 A.M. classes. How can you give your best effort in every area of your life? What bothered Pat Summitt was not the loss itself. She didn’t accept the poor effort from her players in that game. That is the aspect we can apply in everything we do at school, in sports and exercise, and in our jobs. In this video, I explain how we can give our best effort in every aspect of our lives to become a champion in sports, business and life. Piriformis syndrome: What is it, and how can you get better? Episode 387: Is platelet-rich plasma (PRP) better than hyaluronic acid for knee arthritis?